Browse our great selection of industrial strength commercial grade canopies in a wide range of sizes for all purpose out door commercial use. Commercial grade canopies are made to handle the most strenuous out door jobs from covering heavy machinery and food supplies to sheltering animals and events. Tough and durable these out door pop-up shelter covers can be used for any number of heavy duty protection needs including covers for boats, farm equipment, complete lawn party set-ups and much more. 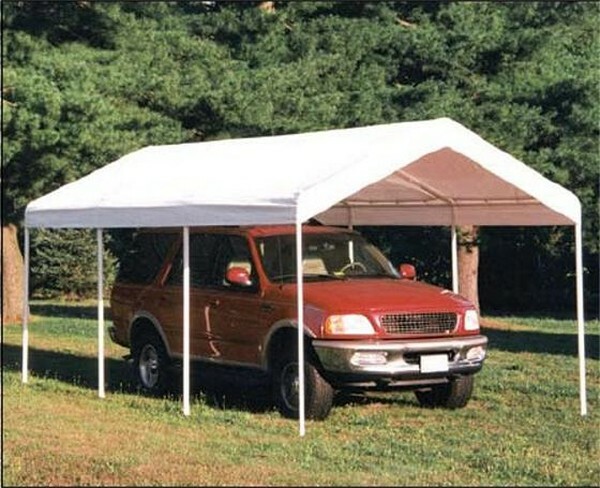 Even with a 300lb cover and up to 14 leg and foot plates these canopies can be set up and taken down in minutes, transported with ease and stored in small areas. All purpose commercial grade canopies feature powder-coated steel tubing, foot plates and spike anchors. Full valence covers come in white or grey and feature polyethylene material that is waterproof and UV stabilized. Commercial grade canopies can be accessorized with a number of additional products including replacement covers, anchoring kits and enclosure kits depending on your immediate needs.